Smaller products will be shipped by UPS or FedEx Ground. Magnolia Hall can ship to a U.S. agent who would be responsible for receiving, inspecting, and signing for the product in our customers behalf. This would conclude the purchase and Magnolia Hall’s liability for any damage that may occur afterward. Each customer would be responsible for the freight charges and any other charges, such as duties and taxes. Magnolia Hall can ship to a U.S. agent who would be responsible for receiving, inspecting, and signing for the product in our customers behalf. This would conclude the purchase and Magnolia Hall’s liability for any damage that may occur afterward. Each international customer would then be responsible for making their own shipping arrangements from the U.S. to their location. Sun Delivery is an expert in "white-glove" home delivery throughout the United States. We provide these premium services to the largest retailers and manufacturers nationwide. Our specialty is in home delivery of furniture. 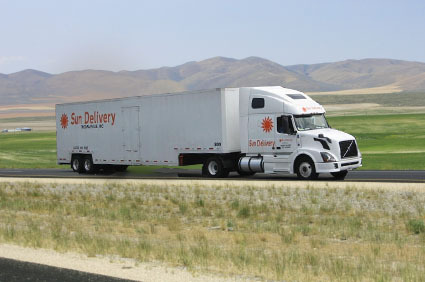 Sun Delivery carries all liability insurance necessary to conduct an inside delivery. * Sun Delivery will ask the customer to clear the area between the entryway and the room(s) in which they would like the furniture placed, as well as, the room itself be cleared out prior to our arrival. We also ask the customer to measure the pathways, stairways, etc. to make sure the furniture they have ordered can be easily placed into the location they choose. We require 3" of clearance on all sides of the furniture in order to make the placement without risk of damage to the customers home or furniture. This is communicated to the customer during the confirmation with the customer. Sun Delivery is not / cannot attach mirrors, pictures or chandeliers to walls or ceilings. The placement of shelves is the customer's responsibility. Special order items are non-cancellable and non-returnable. Other items may be returnable within 30 days, but must be authorized by Magnolia Hall first. If accepted, there will be a 15% restocking charge and actual return shipping costs that are the customer's responsibility. Furniture that is cancelled once it is in transit is considered a return and subject to this policy. NOTE: Failure to make delivery due to inadequate access to the home is the responsibility of the customer and is not considered an authorized return. Once approved, you should expect to receive your refund within four weeks of giving your package to the return shipper, however, in many cases you will receive a refund more quickly. This time period includes the transit time for us to receive your return from the shipper (5 to 10 business days), the time it takes us to process your return once we receive it (3 to 5 business days), and the time it takes your bank to process our refund request (5 to 10 business days). NOTE: Funds will be returned in the same manner in which they were received during processing.